THE “discoverer” of the world’s most ancient pyramids claims to have found a theoretical form of energy coming from the alleged ancient structures. Pseudoscientist Semir Osmanagić claims a series of triangular-shaped hills in his native Bosnia, are artificial pyramids that are bigger and older than those in Egypt. Despite mainstream archaeologists saying they are just natural rock formations, Mr Osmanagic has made another bold claim that he has found Nikola Tesla’s so-called “torison fields of standing energy” at the Bosnian Pyramids site, which means we could now “communicate with aliens”. Mr Telsa was a Serbian-American inventor, physicist, and futurist, who contributed to the design of the AC electricity supply system in 1888. His ideas became more left-field and experimental towards the end of the 1800s, and he devised the theory of “standing waves” of energy coming from Earth that meant electricity could be transmitted wirelessly over long distances. 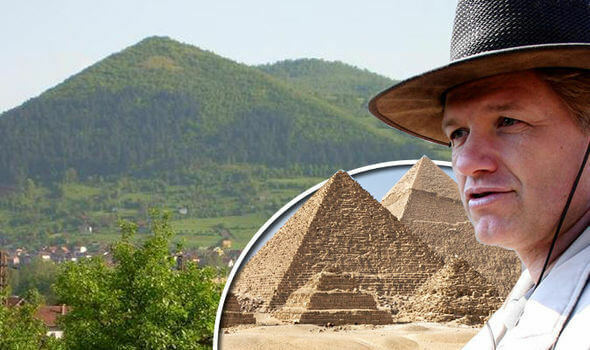 Mr Osmanagić has claimed the alleged discovery at one of the “34,000 year old” pyramids he calls the Pyramid of the Sun “changes the history of planet” and could lead to intergalactic communication. He wrote: “The discovery of Tesla’s standing waves at the top of the Bosnian Pyramid of the Sun— which are believed to travel faster than the speed of light, while not losing strength as they pass through cosmic bodies—prove the existence of something referred to as a cosmic web or cosmic internet which allow for a immediate intergalactic communication throughout the universe. “Recorded energetic phenomena above the Pyramid of the Sun at Visoko seek a different definition of a pyramid compared to conventional, dogmatic explanations. Mr Osmanagić claims on the surface of and underneath the Bosnian Pyramid of the Sun, archaeological digs have found quartz crystals. The crystal is present in the underground tunnels as well, a mineral he says receives then amplifies energy. Yet, the discovery of the alleged energy source, is founded on earlier unproven pseudo archaeology and conspiracy theories. He claims there are seven levels of tunnels inside the pyramid and that this amplifies the intensity of the energy. A Finnish researcher called Mika Virpiranta alleged that there are 26 “volcanic lines” leading to the Bosnian Pyramid of the Sun. Mr Osmanagić said this shows the importance of the location of the pyramids in Visoko, because volcanoes are energy sources. Mr Osmanagić has come in for great criticism from more mainstream archaeologists, who doubt his whole pyramids theory. He said: “My research and arguments that the pyramids were built worldwide, and that the oldest pyramids are also the most superior ones, has led to situations where Egyptologists have created a wall of hostility towards me. “Our evidence which points that the oldest and concrete of the highest quality on Earth can be found at the Pyramid of the Sun, and the existence of the largest networks of prehistoric tunnels has resulted in written petitions being sent to the European Archaeological Association against our research.